Samuel Ndonga will compete in five events including his specialty 50m, 100m and 200m breaststroke, 50m freestyle and 50m butterfly. 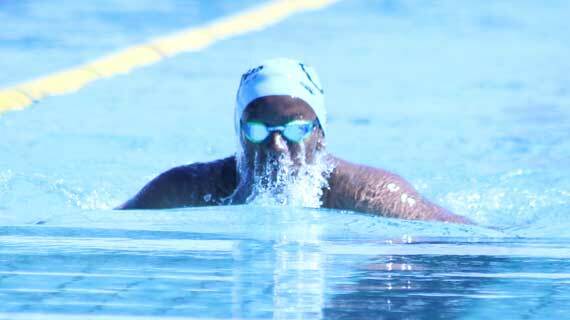 Breaststroke ace Samuel Ndonga is optimistic of making the cut to the Worlds Championships and Africa Games teams. Ndonga will be among those taking part in the national swimming trials at the Moi Sports Center Kasarani Aquatic Stadium. The Trials that started on Thursday will run through to Sunday. Ndonga will compete in five events including his specialty 50m, 100m and 200m breaststroke, 50m freestyle and 50m butterfly. The former Secondary Schools Sports Association’s swimming winner with Aga Khan Academy Nairobi has said that despite yearning to represent Kenya at the World Championships in July and All Africa Games in August, his top agenda is to bring down his times especially in the 50m and 100m breaststroke. “I will give it my best shot at the trials. I am looking to book a place in the team for World Championships and this ultimately means I have to lower my times. I believe the national records are within reach if I push myself harder,” said the Otter Swim Club swimmer who indicated that he expects unwavering competition from Mabisi Abdulhalim and his younger brother Emmanuel Ndonga in breaststroke events. The swimmer wants to bring his breaststroke times close to that of the World Record- 25.95 (50m) and 57.00 (100m)- set by Adam Peaty in Hungary 2017 to increase his chances of making it to Team Kenya for Tokyo 2020. A swimmer can also qualify for the Worlds on FINA Points as the closer one comes to the World Record, the more points they garner. “Breaking records will bring me closer to qualifying for the Olympics,” added Ndonga. Samuel's best time in the 50m swim is 30.55 and 1:09.70 in 100m and is aiming to erase Micah Fenandes national records of 30.08 and 1:07.09 respectively. In his preparation for these trials, Samuel notes that even though he had limited time after the National Long Course Championships in February, adding yoga to his three-hour gym workout and seven swim sessions a week has helped.